I’m more likely to die cycling my bike on the road than I am flying. I do a lot of cycling, too, and although I cycle on mountainous roads that are often empty, I still understand the risks of what I do. This compelling anti drink-driving ad from Fiat brilliantly and simply reminds us of one of ways in which we can reduce the danger to cyclists: alcohol and roads do not mix. The beer can says it all. 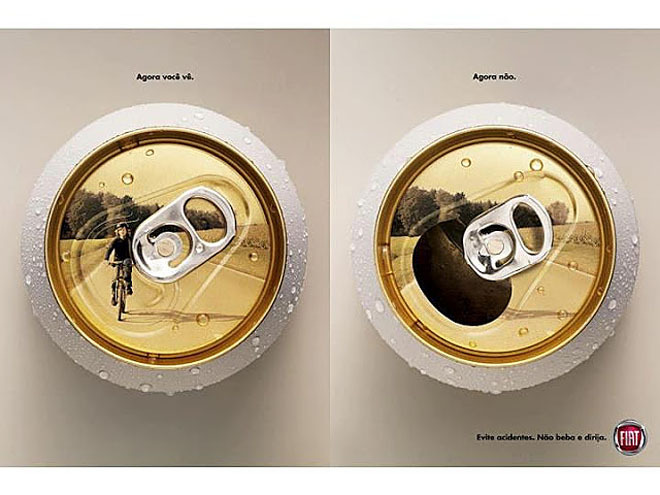 Despite being in Portuguese, its message is clear in any language: stay safe and keep those safe around you – don’t drink and drive. This entry was posted in Arts, Current affairs, Food and drink, Media, Photos and tagged advert, advertisement, commercial, cycling, drink driving, fiat by philgreaney. Bookmark the permalink.